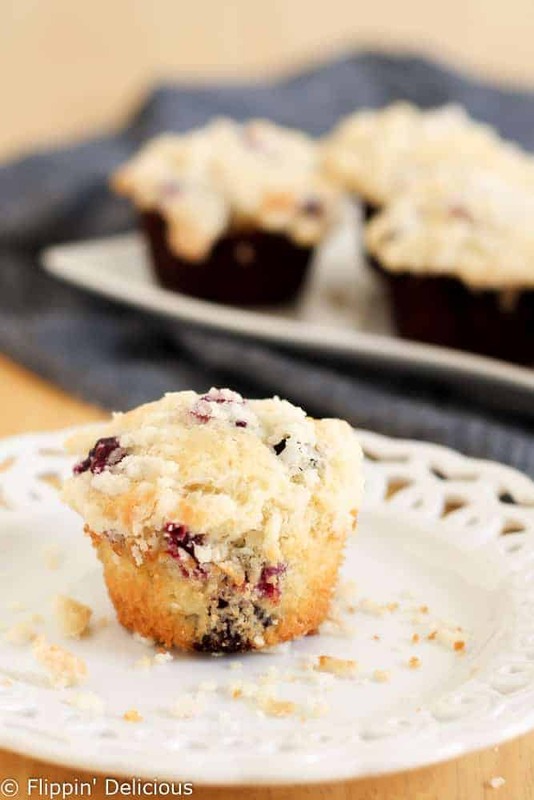 Gluten Free Blueberry Streusel Muffins are the perfect sweet start to your morning. The streusel crumb topping makes them really special! I have had a love affair with blueberries for ages. When I was a teenager, every so often I’d have what I called a “blueberry mood.” I was not sad, but instead just was really craving blueberries and felt like wearing a skirt instead of a pair of jeans. I’d make a chocolate blueberry crisp (I’ve got to get that recipe on Flippin’ Delicious soon. That is a great oversight!) and then sit on a bench outside with a good book. And eat the entire crisp by myself. It was just a feel-good, skirt-wearing, blueberry-eating mood. That crisp I’d make, was basically just gluten-free streusel crumb topping baked on some blueberries tossed in sugar. Super simple! Well I love putting a gluten free streusel crumb topping on all sort of things, like these blueberry muffins. The streusel crumb topping is sweet, buttery and crisp. I just love the texture that it brings to blueberry muffins. It makes them special. 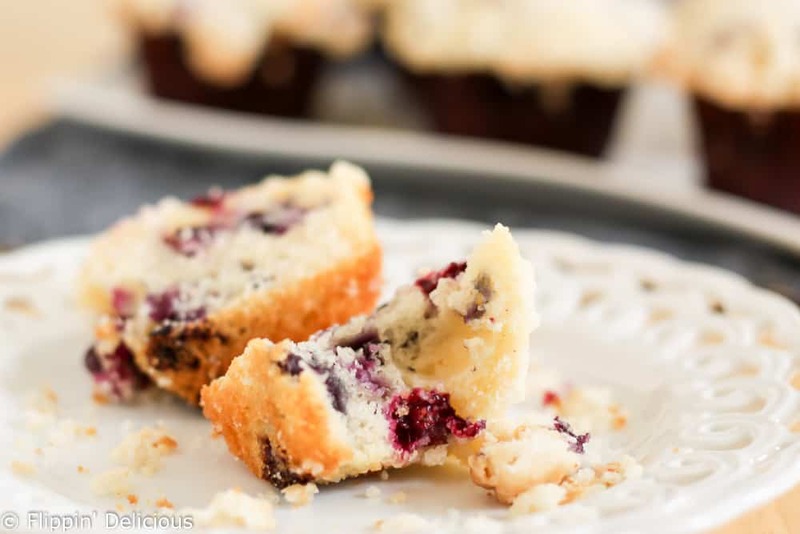 If you are looking for a lower-carb or paleo muffin, My friend Erin of Texanerin Baking has the perfect Paleo Blueberry Muffins for you. I actually made these muffins and photographed them more than a year ago. A YEAR! When I had just finished taking the pictures Miss E, my then 2-year-old, helped herself to a muffin, accidentally knocking that pretty white plate onto the flour where it broke into a dozen pieces. It might have partly been the pregnancy hormones, because I was also 7 or so months along with Baby T.
Miss E was so sad that I was so upset. She said “I’ll buy you a new plate mommy!” and helped clean it up. I’m embarrassed to say that I stayed grumpy and mad at her for about an hour. It was not a good parenting moment for me. I think it was one of the first times that I actually got mad at my little girl. Anyways… these muffins come to you after a great delay and plate smashing adventure. They sure are tasty, I’ve made them several times in the past year. 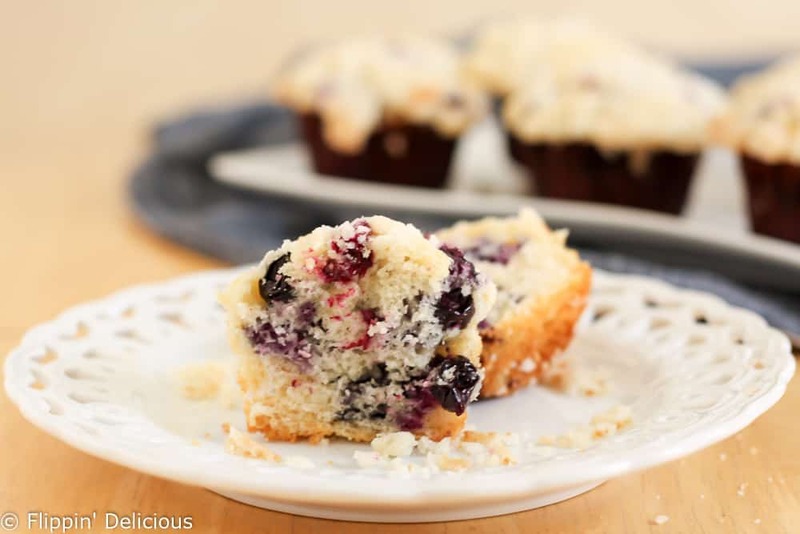 Winning gluten free blueberry streusel muffin recipe right here! First make the streusel topping. Mix together the flour and brown sugar. Cut in the butter until crumbly. Set aside. In a bowl, mix together the flour, sugar, xanthan gum, salt, and baking powder. Make a "well" in the dry mixture and pour the oil, milk, egg, and vanilla into it. Whisk the wet ingredients together, and then mix it all together. Fill muffin cups lined with paper liners about 1/2 full of the batter. Top with the streusel crumb topping. Bake for 22-28 minutes, or until a toothpick comes out mostly clean, with maybe a few little crumbs. Chocolate Blueberry Crisp?! Girlllll you’ve gotta get that up on your blog! I can’t wait. I love blueberries and I’ll definitely be trying these soon. Haha. Yeah… I do need to get that up there. I used to make it and eat it once a month, but I haven’t made it in years. WoW! 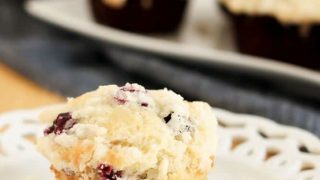 These muffins look flippin’ delicious! I have been craving blueberry muffins like crazy all week! Thanks so much for sharing your recipe! You are welcome! Enjoy, Andrea! If my gf all-purpose mix alreasy has can than gum in it, do I need to add the extra in this recipe? No. If your flour mix already has xanthan gum in it adding more will make your muffins gummy. The flour blend I used didn’t have any xanthan gum in it. This sounds delicious! Do you think this would work well in a loaf pan instead of muffins? I see no reason why it wouldn’t. That sounds delicious! Very tasty but no way did it make 12 muffins. 8 at the most with standard tins! What happened?? Hi Arlene, I do not know why you only had 8. I use standard tins and consistently have 12 muffins, sometimes 13. It is possible you filled your tins more than I do. Wow these are so good! Used frozen blueberries and bobs red mill 1:1. Turned out great! Overall the muffins were very yummy. unfortunately the recipe barely made 9 muffins for us and i had to add some extra milk to the muffin mixture as ours was a bit too thick to place in the tins. I also played with the balance of flour vs sugar in the streusel mixture because the end result was a little flour heavy for me. Hi Tiffany, So happy you enjoyed my recipe. The batter is a little bit thicker so prevent the blueberries from sinking. May I ask what brand of flour you used? Different flours absorb liquids differently, and may cause your batter to be too thick. I’m glad a little extra milk fixed that. I use Namaste Perfect Flour Blend! Hi Tiffany, I haven’t worked with Namaste’s flour, however I love some of their other products. Their flour most likely has a different absorption rate than mine, which caused the batter to be so thick. It is a really common issue, since all gluten-free flour blends work a little bit differently in different recipes.